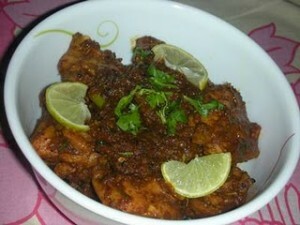 Ajwain (Carom Seeds) Chicken recipe by Nazia Nazar at DesiRecipes.com. Marinate chicken pieces with yogurt, carom seeds, ginger garlic paste, red chilies and salt for half an hour. Heat oil in a thick pan and add chicken pieces. Do not add the the extra marinade. Cook chicken until it turns brown and all juices are absorbed. Keep moving it to ensure even browning. Lower the heat and add the rest of the marinade. Add + cup of water, cover and cook on low heat until the chicken turns tender. Add cream and chopped cilantro. Continue frying this until chicken is dry and well coated. Serve hot. Depending on the kind of chicken , the cooking time can vary. You can omit water in step 5 altogether if the kind of chicken you have, cooks easily. Using thigh and drumstick will not make the meat hard when overcooked. Where does the extra marinade come from? Please clarify.thanks. i am excited about this recipe. I have not yet cooked but seems it is easy preparation and easy cooking this recipe. You talk about extra marinade. Where is this in the recipe?